The Benromach 10 was the whisky that led me to the rabbit hole of whiskyland. AliceInWhiskyland bought me a bottle for my birthday and it’s been a best friend ever since. It’s actually the 3rd whisky I’ve ever tried and the expression that I have bought more than any other. So it definitely has a place in my heart and cupboard. 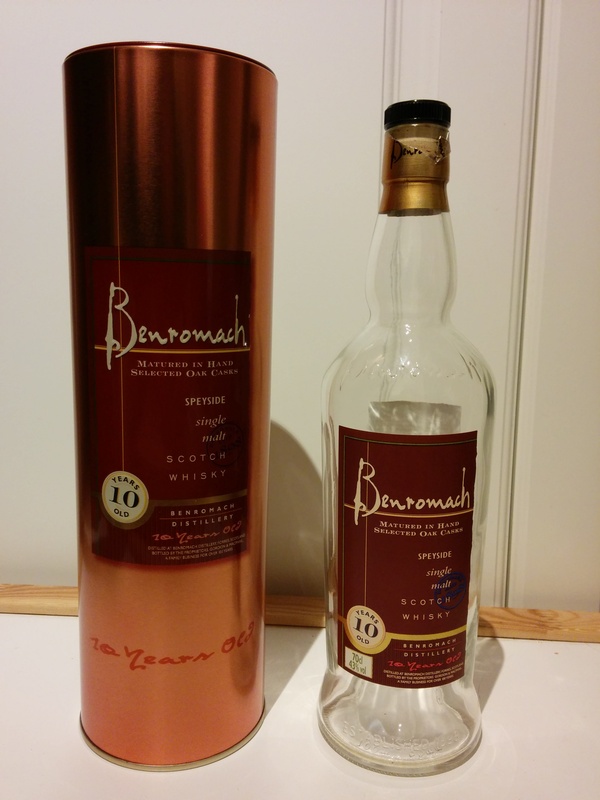 Note: This is an older batch of the Benromach 10 from when they came in copper coloured tins. Newer batches seem to have a slightly different profile that is a bit peatier. According to Benromach, the 10 year old is comprised of only first fill sherry and bourbon casks. Benromach make peated and unpeated whisky and I believe they mix the two to make expressions like these since their peaty whiskies are relatively high ppm’s of about 50-60. This expression is quite peaty for a speyside but definitely no where near the Benromach Peat Smoke expression. The last embers of a dying fire, the traces of smoke. Rich sultanas soaked in brandy with a moist fruit cake and custard. Needless to say the nose is quite good. A bit spicy in the foreground, some cinnamon. Some fruits in the background. Slight tanins, oak chest, tea. A bit of peat. Reminds me of sitting in front of a fire in an old library and drinking tea even though I’ve never done all three of those things together. This is one of my favourites. For the price point it’s hard to beat. A really good balance of peat, spice and fruit. Despite the ABV it is rich and complex. Crisp pears and the sweet smell of toffee apple with trailing peat. The sweetness in the nose greets you initially but quickly dissipates to earthy, oak notes. The finish is very warm with lingering peat tones. A perfect goodbye. A truly universal whisky. I love this bottle. It is the first single malt we bought when coming to Edinburgh and is one that I am always happy to revisit. I would recommend this to both the novice and established whisky drinker for a well balanced, well priced, go-to dram.